I admit it. I am a book nerd. I love everything about books…the way they smell, their weight in my bag, how elegant they look lined up on my bookshelves and stacked on my tables. I love the excitement of finding a new, favorite author and reading everything they have ever written. I love hardcover books and paperbacks, new and used. All genres welcome. And books are my favorite gifts to give and receive as I know that choosing the perfect book for someone takes time, patience, and love. If you are looking for a whimsical, entertaining, make-you-smile sort of book for yourself or for a fellow bibliophile, look no further than Debbie Tung’s “Book Love.” Debbie is a cartoonist and illustrator and her charming artwork and spot-on observations of what it means to be a book nerd are there to enjoy on every page. She captures the way we all feel when someone asks to borrow one of our beloved books, or we find a book that has been dog-eared or torn, or we pass a bookstore with a “going out of business sign” in the window. She knows how we feel when we get lost in the stories that capture our imagination and how we thrill at finding kindred spirits who love the same books that we do. She also knows how touched we are when we find a message in a previously owned book, or someone’s thoughts in the book margins, giving us insight into the person who was last swept away by the same story. Sharing a book you love is the ultimate gift, and I loved this book and I want you to love it too. 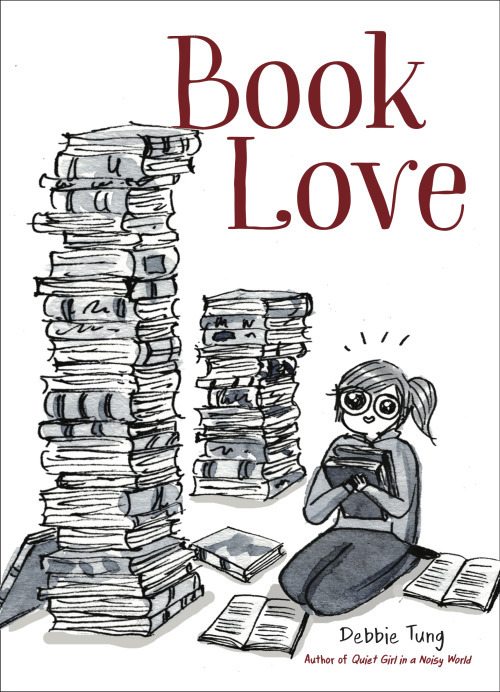 I am giving away my copy of “Book Love” to one lucky Sweatpants & Coffee bibliophile. Tell us what you love most about books and you could be that person, chosen at random, to read my copy of “Book Love” next.